Prices in Germany are normally 75% below the cost for a Laminectomy in the US and are individually quoted. They include all medical expenses, the hospital stay, surgeon's fees, operation room fees, anesthesia, anesthesiologist's fees, medicine, nursing, semi-private room, meals, pre-op diagnosis, local phone and English TV. Laminectomy is a surgical procedure for treating spinal stenosis by relieving pressure on the spinal cord. The lamina of the vertebra is removed to widen the spinal canal and create more space for the spinal nerves. A Laminectomy is not recommended in people under 35 and should not be done on multiple adjoining levels, because it can destabilize the spinal column. 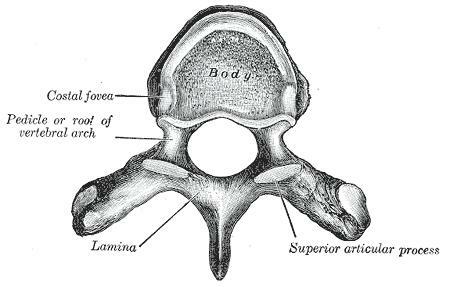 To the right is the upper view of a human vertebra, showing the lamina. The first laminectomy was performed in 1887 by Dr. Victor Alexander Haden Horsley, a professor of surgery at the University College London. A common type of laminectomy is performed to permit the removal or reshaping of a spinal disc as part of a lumbar discectomy. This is a treatment for a herniated disc, bulging or degenerated disc. Laminectomies are also used trim bone growth in the spinal canal, most noteably from the facet joint or to trim calcification of the spinal canal. One of the most common reasons for laminectomy is a prolapsed or herniated intervertebral disc. If the herniated disc is in the lumbar region, this can cause sharp and continuing back pain, a weakening of the muscles in the leg, and some loss of sensation in the leg and foot. It may also be difficult to raise the leg when it is held in a straight position. A herniated disc in the neck region can cause symptoms including pain, numbness and weakness in the arm. A herniated disc may be triggered by, for example, twisting the back while lifting something heavy. The surgeon will attempt to relieve the pressure on nerves and nerve roots by removing the pulpy material that is protruding from the disc. Laminectomy is usually performed under general anaesthetic. The patient is placed face-down on the operating table. The exact procedure depends on the location of the herniated disc; e.g., if the disc is located in the neck, the head is clamped to prevent movement. The skin is marked for incision. The surgeon first cuts through the skin. The muscle is then cut, peeled back from the vertebrae and held in place with special instruments called retractors. The spinal processes of the vertebra is removed. The lamina, which is between the bony projection of the vertebrae (the 'points' that can be felt with fingers) and the transverse process or 'wing', is removed. What happens next depends on the problem. For example, the surgeon may then trim the protruding bits of a herniated disc or the interior protion of facet trim. Once the surgery is completed, the muscle and skin are sutured (sewn) closed. Routine post-operative observations will be taken and charted, including temperature and blood pressure. The patient's wound is checked for redness, swelling and signs of infection. Muscle spasms are quite common following laminectomy. Pain relief is ordered and given regularly. Note is made of ability to pass urine, as sometimes this may be affected immediately following surgery. The patient may have intravenous fluids for a few days, which may include an antibiotic. Initially, two people have to help the patient to roll over in bed. The patient is taught the proper method of rolling the body in order to maintain proper body alignment. This is most important for the first 48 hours or so. The patient is assisted out of bed after a few days. A physiotherapist gives specific instructions on how to get out of bed properly in order to avoid stress and strain on the wound site. The patient is encouraged to walk, stand and sit for short periods. The patient is taught how to prevent twisting, flexing or hyperextending the back while moving around. A regular exercise program following surgery is most important to increase your spinal muscle strength and flexibility, and to protect against future injury. Occasionally, the operation doesn't work and the original symptoms remain. At other times, the operation isn't expected to relieve symptoms, but is performed to prevent the area from deteriorating further. In this case, original symptoms will probably remain, but might not get any worse. Some patients may develop chronic back pain after laminectomy surgery, a medical condition known as "postlaminectomy syndrome." Some surgeons believe that the laminectomy procedure, by removing excessive amounts of bone and ligament from the spine, disturbs the biomechanical stability of the spinal column, resulting in pain. Alternative techniques for decompressing spinal nerves with minimal disruption of spinal stability have been developed and include microsurgical lumbar laminoplasty.